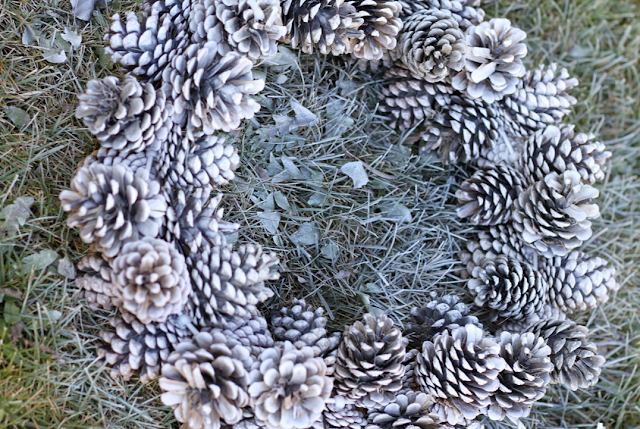 Have you seen THIS tutorial for the most amazing Christmas bulb Wreath tutorial ever? You should check it out. 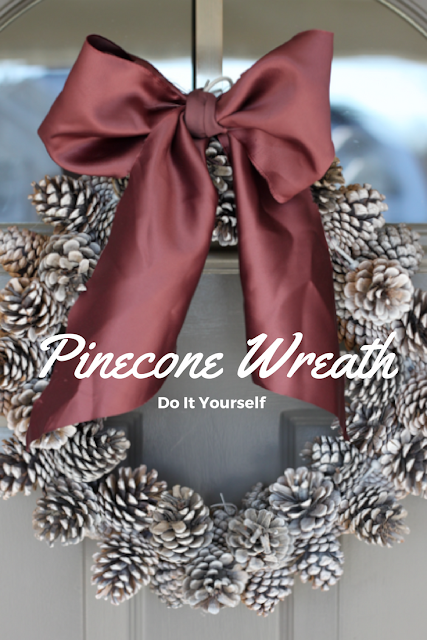 I got my inspiration there for my pinecone wreath. My sister-in-law and brother-in-law just chopped down a few HUGE pine trees in there yard. 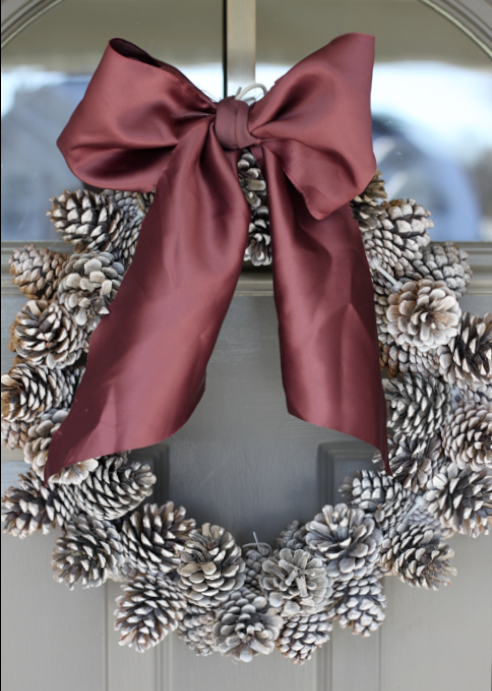 As soon as I heard the news I sent my husband over to their house to collect bags of pinecones with a pinecone wreath in mind. 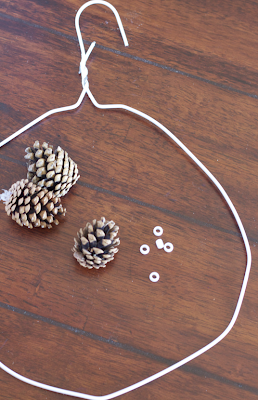 In the Christmas bulb wreath tutorial you attach the bulbs using the wire topper to the hanger. Obviously pinecones have no wire toppers, so after a lot of thinking and walking up and down the isles of my local craft store, I decided to hot glue beads to the bottom of each pinecone. Pony beads worked like magic. After I hot glued the beads I simply strung the wire hanger through each bead and arranged the pinecones how I thought they looked best. Try to make the beads almost touch one another so that there are no gaps between each pinecone. This may take a little wiggling and adjusting but it will turn out beautiful. 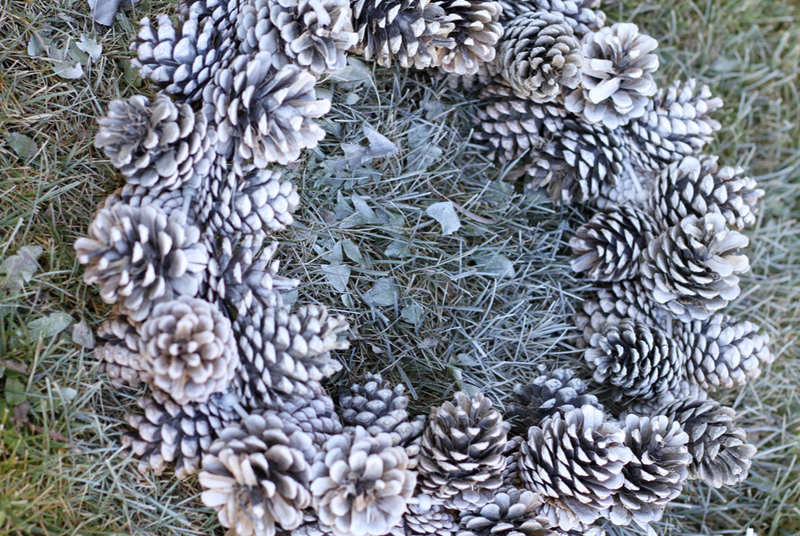 Once all the pinecones make a lovely wreath you can be done, or like I did, lightly spray paint them with white spray paint. This will give the snow-kissed effects, if you will. Finally attach a big bow and hang her up. It´s excellent. Easy and quick. I´m going to write about this and other of your ideas in my blog. I hope you don´t mind. Contratulation for your blog it´s great. So beautiful and easy to make! Extraordinary idea! genius! 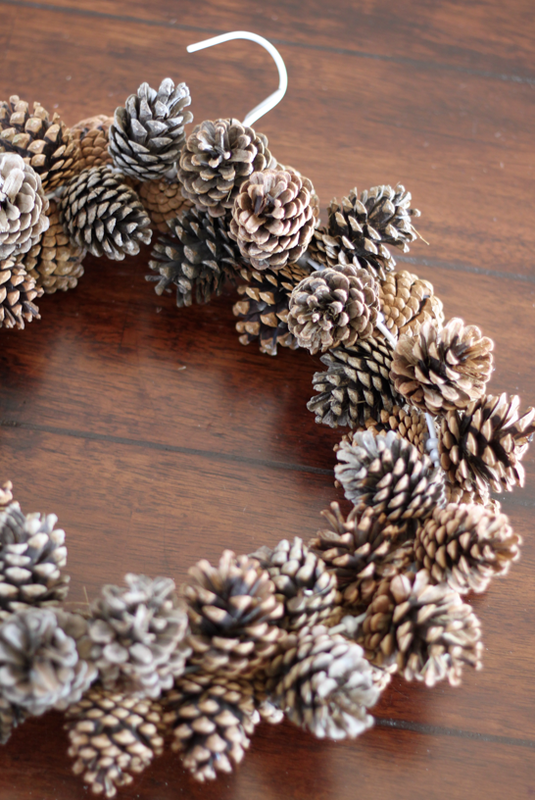 I've been wanting to make a pinecone wreath but most of the tutorials recommend cutting pinecones to fit them into the gaps, which just seems like a bigger mess than I'm willing to make. This looks so much easier! Love this idea! Hopefully I can find some pine cones in the neighborhood as we do not have any in our yard. I was just looking at wreaths to purchase. Love, love, LOVE your idea!! Thank you so much! I have been craving those Christmas wteaths for ever! But they r so ridiculously expensive thst i could not make myself get one. This year it's. gonna change and my front door will be the queen of the castle!! 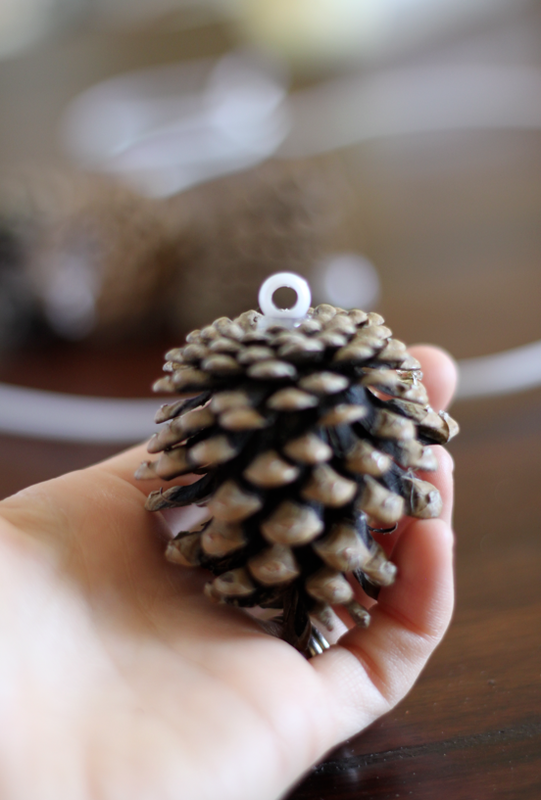 I think instead of hot glue I would wrap so twine or fishing line around the pine cone and the bead for longer lasting use. I would also use some narrow ribbon to wrap around the wire hanger to hide it and add some color. Yes! Hot glue has a very limited reliability and I wouldn't trust it very long on a door that is constantly getting opened and closed. 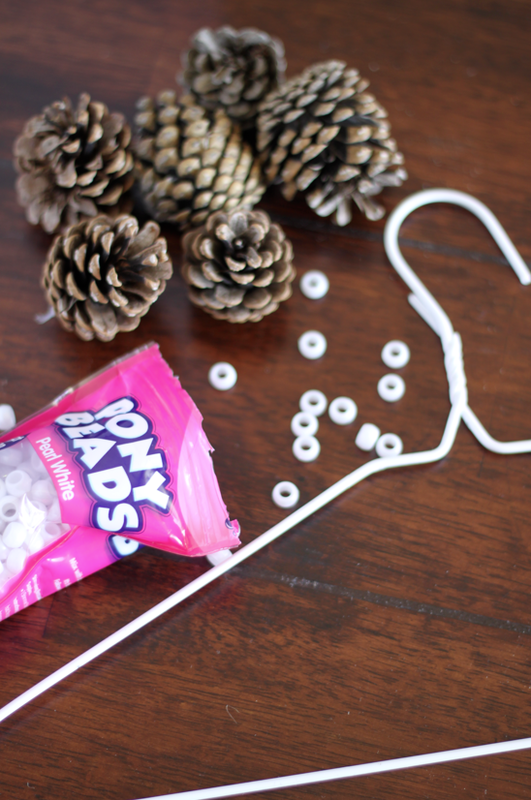 I LOVE this idea…I love the natural look of it without any paint…so, Dani, are you saying you would not hot glue the pony bead at all, but instead just wrap twine or fishing line around the cone and connect them together like that? 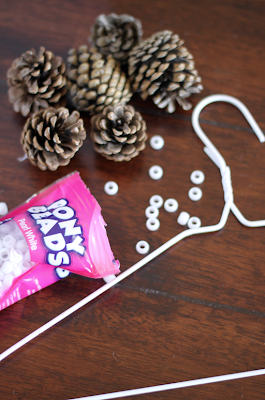 I like your idea of wrapping the hanger…this is so my kind of craft idea!!! 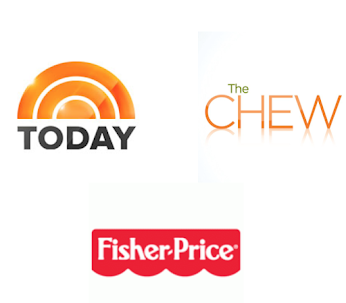 Cheap, easy, and quick…thanks so very much for sharing!!! Did the hot glue last? Approximately how many pine cones do you need? Thanks for the help...I'm looking to try this this weekend! This sounds awesome! And I have a bag of pinecones I've been hanging onto for just such a crafty idea lol! 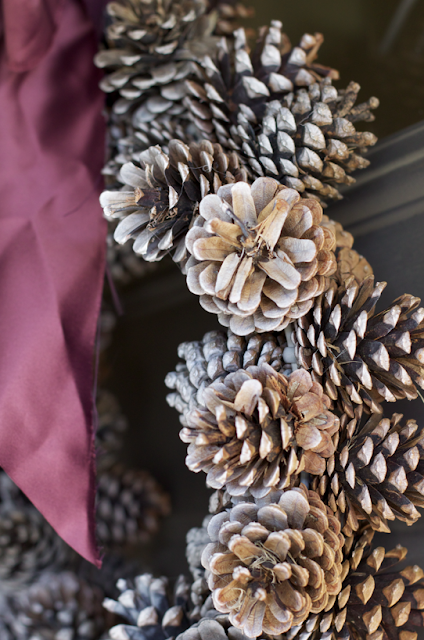 You could spray paint the hanger before attaching the pine cones to disguise the ugliness instead of ribbon. It may add a nice but subtle background color or spray paint the same color you will spray the cones when finished. 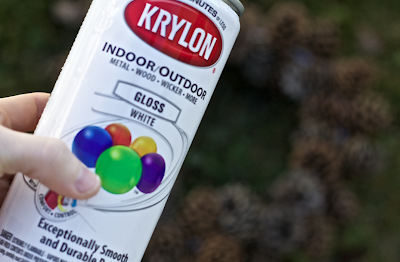 Does anyone have suggestions about spraying pinecones that you find outdoors to get rid of bugs that might be living in them? I've seen on Pinterest and other craft sites that baking them at a low temp will get them. First of all..........I love this wreath!!!! 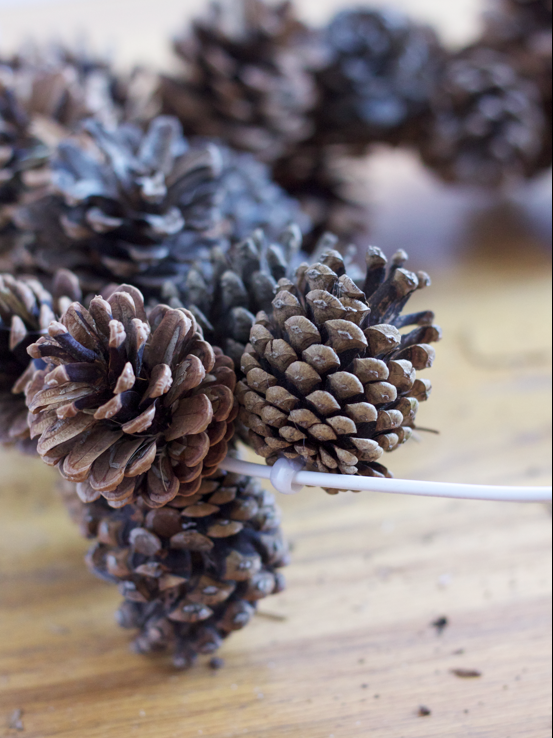 Secondly, regarding bugs: The technique I use to make sure they are rid of pests is to bake the pinecones or microwave them. Hope this helps. I live this wreath, do you mind if I share this on my blog? Live your blog great ideas. We would love you to share our wreath, just make sure you don't copy and paste our instructions on your blog. You may direct traffic this way for instructions. Thank you! Now I know how to string the pine cones I gathered last winter, wanting to make a wreath! Brilliant! Thanks for the great idea. I have a whole neighborhood full of pine trees. This is an awesome idea that I will gladly make use of. Thanks for the inspiration. I had the same idea! Except hot glue didn't last long in weather and with kids slamming doors, so my son had the brilliant idea of using his rubber band bracelet kit to secure the beads. We knot two tiny rubber bands together, thread the bead through, and stretch each band down through the pine cone petals. It works amazingly! We just moved and I finally separated out all the wire hangers we have. My hunny told me to get rid of them, but I said no. I was sure I could find a use for them on Pinterest and here it is! Love this idea and it's extremely low cost so I can make them immediately. Thanks for sharing! Hey!! Happy to see this unique pinecones wreath. Want to have it for my party decor at one of Chicago event space. Have never done décor with such an awesome wreath. But would love to do it. Thanks for this best wreath idea. What a clever idea. Lovely wreath. I am crafting Christmas things at the moment and shall include this one. Thank you for tutorial.